Speakers at the Greater Lincolnshire Manufacturing Conference, held in Sleaford. Discussions on ‘robots versus humans’, Brexit and the future of manufacturing in Lincolnshire have been held at a conference in Sleaford. The Greater Lincolnshire Manufacturing Conference invited businesses from across the county to ‘discover the exciting and revolutionary developments happening in the manufacturing sector’. The event was held at Sleaford Quality Foods site in Sleaford, and saw a ‘fantastic turn-out’ according to organisers, with 120 delegates attending on the day. Hosted by the Business Lincolnshire Growth Hub and NatWest Bank, the event featured a number of speakers giving insight within the industry, as well as exploring the latest trends and challenges. Demonstrations given included some of the latest robotic technology, along with discussions about how modern machines could help to drive productivity. The event included a discussion led by Mark Norris, head of industrials at the Department of Business, Energy and Industrial Strategies, on how Brexit is likely to affect manufacturing businesses, including their export potential, EU workforces and costs of importing materials. There were keen talks around the room regarding the final decision on the potential of a no-deal Brexit and the changeable outcomes of the exit from the EU. 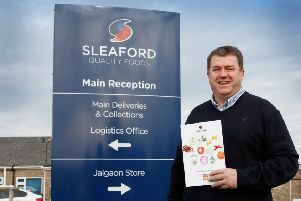 Sleaford Quality Foods’ managing director James Arnold, said: “It was an interesting and informative day for all, and we were pleased to have been a part of this year’s event.